HAVE I really won? Yes, you’ve won. Have I? No, seriously have I? Yes, you’ve won. Andrew. Tell her she’s won. Yes, you’ve won. See even Andrew Mennear has said it. You’ve won. Have I? Really? 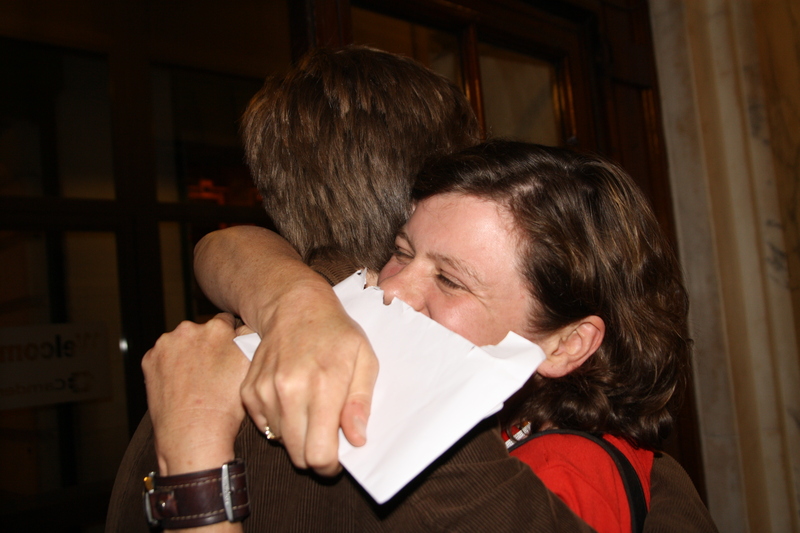 The last few moments before Sally Gimson became Councillor Sally Gimson were fuelled with emotion and almost disbelief. There was only a mild scent of heading towards recount territory earlier in the evening of this Highgate by-election count but everyone knew before council chief executive Moira Gibb read out the results. Ms Gimson, shaking in her politically provocative red dress, had fended off the challenge of the Greens and the former eco champion Alexis Rowell. She got 1,178. He got 947. The coalition parties proved to be, at worst, also rans with the Lib Dems sinking to 111. The emotion and worry from Sally, that somebody had made a mistake in the scores betrayed the tension surrounding this poll. Strange, you might wonder, given that the poll was not going to change overall control at the Town Hall. It was just to decide whether Labour would keep a collection of 30 councillors in Camden or whether the Greens would advance to two. Think of those stats and think which party needed to win more. Well, actually, Labour maybe felt they needed to. Certainly, Sally, who despite her good temperament and outgoing popularity has been here before and lost. In Gospel Oak in 2006, when Labour surrendered supposed safe seats to a Conservative assault, she was on the ticket. And the party too felt it needed to defend the Highgate hood. In tacky headline terms, the party didn’t want to lose in Ed Miliband’s backyard. The sniff of defeat may have kept him off the campaign, wary of being associated with possible losers. But strategically too, Labour also want to send a message to Camden that the Greens are punctured, holding a third of the seats they did 18 months ago and unable to constitute a group with just Councillor Maya De Souza in office. Clearly Labour want to make sure that no impression is given to anywhere in Camden that the Greens can rise again and are worthy of even a protest vote. The result didn’t quite snuff out the Green threat in Camden for the future, don’t rule them off just yet. A boisterous campaign garnered more votes than the party generally expects from council by-elections in London – by quite some way. The mistake they possibly made was trying to hit Labour during the campaign. In what is a leftyish area – a mixture of council estate blocks and middle class self-prescribed guilt – the enemy has grown from the Conservative and Lib Dem coalition. The Greens might have spent more times attacking Cameron and Clegg than Labour rivals locally. Maybe voters thought: why are they attacking, they are not even in government. No byelection finishes without a few claims of dirty tricks and naughty behaviour. Whoever spat in the custard first, what is more relevant is the strength of the Labour team assembled here. Some recruits from Haringey, Camden activists, a host of MPs and ex-MPs were pulled in. It was a powerful unit for a fight over just one seat on the council. Again, the fear of defeat might have been the best spritzer. Alexis was sorrowful that he could not pull off the same ambush he masterminded for the Lib Dems in Belsize five years ago. But he praised his team of Green colleagues for their energetic assistance. There was sniping that he would be hopping parties again soon afterwards, but maybe he sees himself moving his profile up the party’s national ranks now. It’s dangerous to second guess him. He would have been an entertaining, interesting councillor, in his second stint. But don’t think Camden is getting one of those members who sit there gawping and never say anything in Ms Gimson. She can be loud too. What’s obvious is that she has the respect of large parts of the local group (although, it was interesting, cough cough, to note who wasn’t there for this morning’s winners photo shoot and party). Watch out for her. Behind that booming cackle is a woman who clearly wants to put something back. Whatever colour your rosette, rest assured, she cares. I fully empathise with Sally Gimson brief sense of disbelief. That is exactly how many felt when reading her campaign leaflets. Anyway, well done.